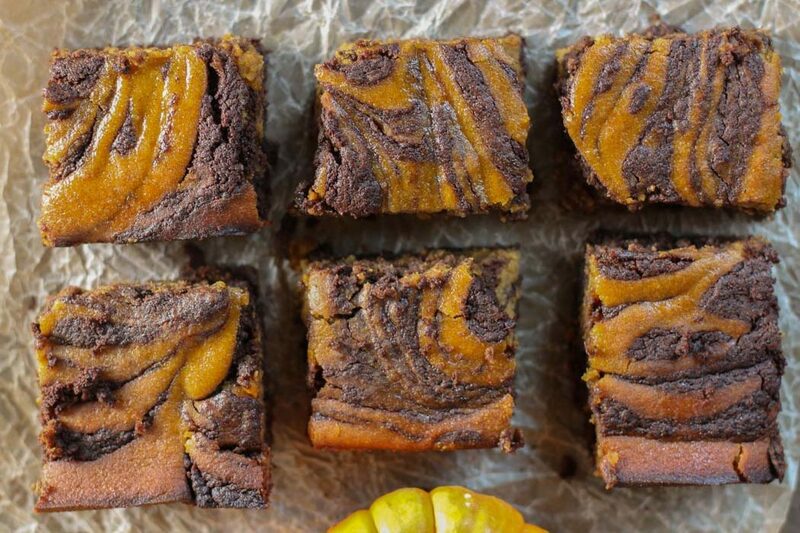 These Paleo swirled pumpkin chocolate brownies are as beautiful to look at as they are delicious to eat! Loaded with good for you ingredients this is a treat you can feel good about eating and feeding your family too! Wanting to create a combo of two of my very favorite flavors, these brownies were born!! 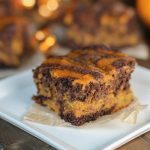 My hubby LOVES pumpkin and chocolate, so I am always looking for new ways to incorporate the two flavors. I just love the look of the bright orange batter swirled with the dark chocolate! It looks super dramatic, but couldn’t be easier to achieve! I also added some healthy ingredients to keep these nourishing: collagen being the heavy hitter! It adds protein, essential amino acids, and is totally amazing for hair, nails, and skin. Since regularly incorporating it into my diet, I finally have nails that don’t break through all my exuberant daily activities! Perfect Supplements is my favorite brand, by leaps and bounds! They actually batch test to be sure there is no Round Up in their product! Use code “TESSA10″ for 10% off any order. Fresh pumpkin is also a nourishing ingredients and so darn delicious! It adds moisture to the end product, as well as plenty of vitamins A and C! I also decided to make this lower in sugar for my family by subbing out half of the sweetener for erythritol, my favorite low carb sweetener! It works magically, especially in conjunction with some stevia glycerite to keep the flavor without adding loads of sugar. 1 cup pumpkin puree I like to use fresh whenever possible! On the stove top in a small saucepan over medium low heat, melt the butter or coconut oil with the chocolate chip. Remove from heat and set aside to cool slightly. In the bowl of the mixer, beat the eggs and sugar (s) until pale yellow. With the mixer on low, continue with the remaining master mix ingredients, mixing thoroughly. In the remaining master mix batter, add the remaining pumpkin brownie ingredients, scraping the edges if necessary to make sure all is incorporated. In your greased pan, scatter globs of the chocolate brownie mix., using most of the batter, but leave parts of the pan that are not covered with it. Now grab the pumpkin brownie mix, and scoop all the batter into the empty spaces (and then some, most chocolate will be covered). Add the remaining chocolate anywhere you see fit! Using a butter knife, gently swirly the mixture in snaking "s" motion throughout to marble the batters. Do not overdo it and start mixing it all together. When you achieve a marbled look you want, place in a preheated oven and bake for 35-45 minutes until the center is just set. Same concept modeled here in a video. These are so perfect for Thanksgiving coming up, no one in our family is that crazy about pumpkin pie but we all love chocolate so… these are a must make! 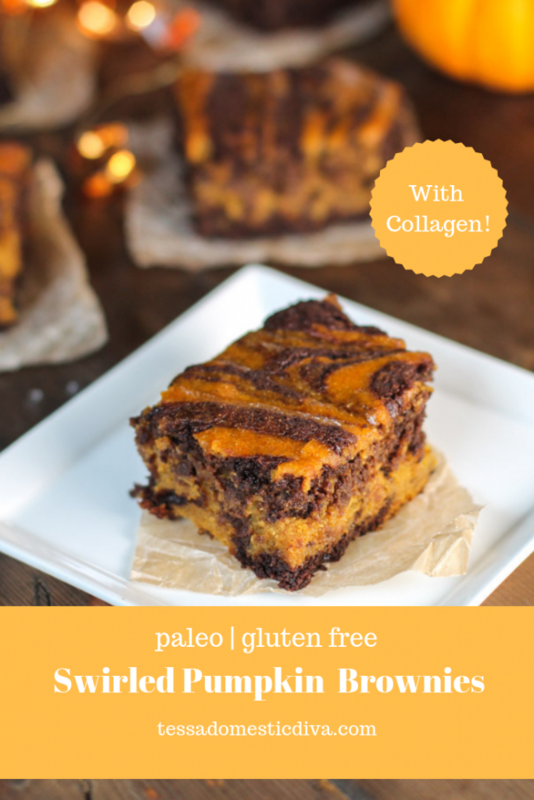 I love sneaking some extra protein into baked treats with collagen! 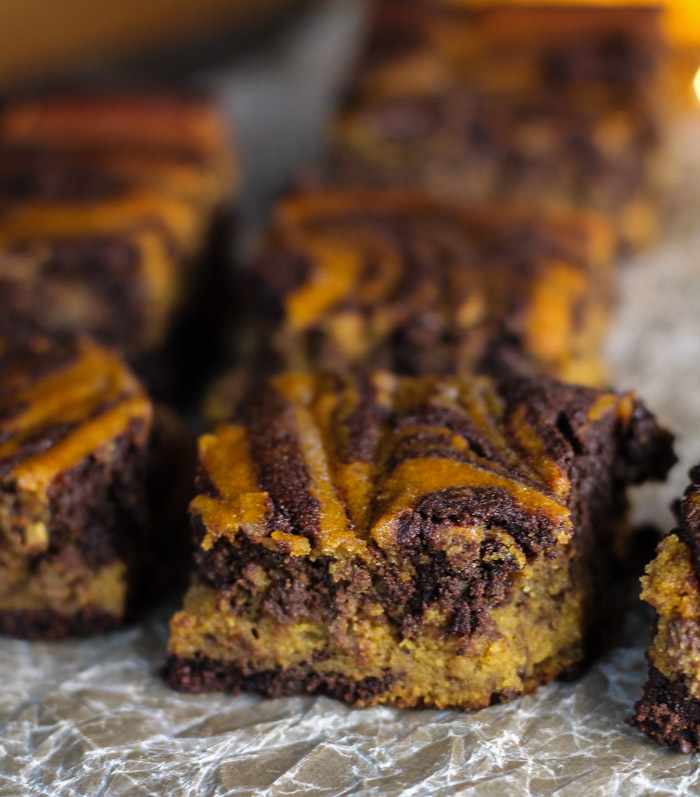 These pumpkin swirled brownies look amazing and I can’t wait to make them. These are super fun! We have to do a second Thanksgiving later next week and would love a treat change up from all the pie we will have at the first one – this would be perfect! Renee D Kohley recently posted…Gluten Free Pumpkin Biscuits :: Easy, 5 Minute Blender Batter! Oh my goodness! What a fun spin on brownies. Wow, these are so darn delicious! I love the swirls! That look so moist and chocolatey delicious ! I so want to take a bite from here ! Loving those gorgeous swirls! Chocolate and pumpkin is such a great combination and loving the addition of collagen! Such a great idea with the pumpkin! 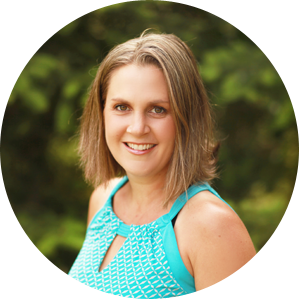 I love that you added collagen too! These look very tasty. How can there be a keto option.? The cassava flour is high in carbs. Yikes! I was planning on testing a keto version by replacing the cassava with part almond (1/2 cup, part coconut 1/4 cup…but since I have not done it yet, I do not want it listed! Thanks for catching that! I wrote this post over many days, lol! SWOON. This looks amazing, and love the combo of my 2 favorite things. So perfect for a Thanksgiving treat! Oh. My. Goodness. These are unreal! Brownies are already a favorite of mine, but these are so perfect and fun for this time of the year. 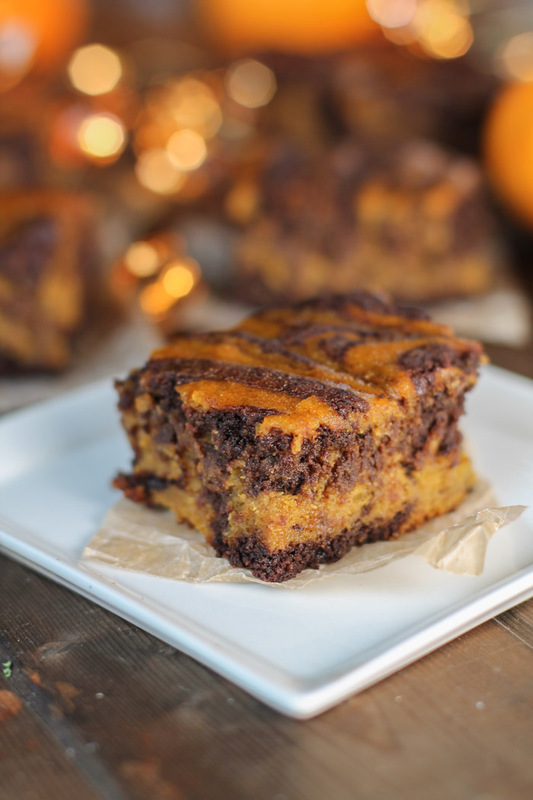 Omg chocolate and pumpkin is such a good combo! Pinned this so I can make it later! What a fun recipe. Looks the swirl, and added collagen! Those are some gorgeous brownies, Tessa! I am pretty sure I need them in my life. Haha!